Lou's Sausage, a Cleveland institution since 1954, has teamed with another locally owned business, Marc's Grocery Stores. You can now find three of our most popular products at Marc's stores around the area. Our Hot Sausage, Mild Sausage, and Kielbasa are now available. All our products are in the stores within hours of being made. Meat & Poultry shows support for Lou’s Gourmet Sausage! The sausage gods must be watching over Lou’s Gourmet Sausage Co. Then again, it’s amazing what a devout customer base can do for a business. 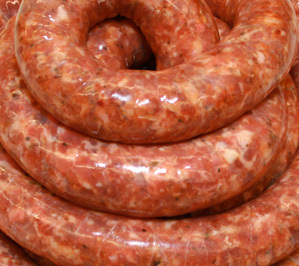 Cleveland-based Lou’s Gourmet Sausage is going on 60 years old. And the family owned business, operated by brothers Joe and Frank Vinciguerra, who took over the business from their father, Lou, and his partner in 1984, is going strong. Lou's Sausage earns federal approval for interstate sales. The Vinciguerra brothers made the decision in 2012 to undertake the labor intensive process of obtaining federal approval of their plant so that they could serve their customers who are out of state. Strict guidelines exist for the preparation of perishable goods to be transported across state lines. The efforts of Lou's Sausage were rewarded in late 2012 when they received final approval of each and every step involved in the production, packaging and shipping of their quality products. They now can offer Lou's Sausage anywhere in the United States. The initial marketing of Lou's is in the Chicago area where Heinen's Fine Foods has recently opened 4 stores. The Vinciguerra's look forward to this exciting new opportunity to satisfy their out of town customer base.